The Breakdown by B.A. Paris is a contemporary psychological thriller and what a fabulous read it is. I was gripped from the start to end. With heart racing, I read on, trying to guess the outcome.. but failed. 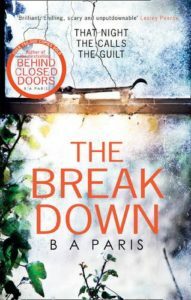 The Breakdown is a clever read as it can be seen on two levels, literal and imagined. Written in the first person, the reader can easily see themselves as the main protagonist. Questioning ones sanity as the action unfolds, the reader wonders what is real and what is imagined? And whose sanity is intact? B.A. Paris has an intricately constructed plotline. As the book progresses, the reader becomes more embroiled in the action. Home, that should be a safe haven becomes more and more terrifying. Who can be trusted? Where does the truth lie?